Welcome to Week 13 of the One Yard Wonders Sew Along! Kathy selected My Folklore Posies Violet + Blue. Kathy used a medium weight fusible interfacing that measured 22″ selvage-to-selvage (shorter than the 30″ specified in the pattern). Two pieces were cut and placed side-by-side. The medium weight fusible was a bit floppy. 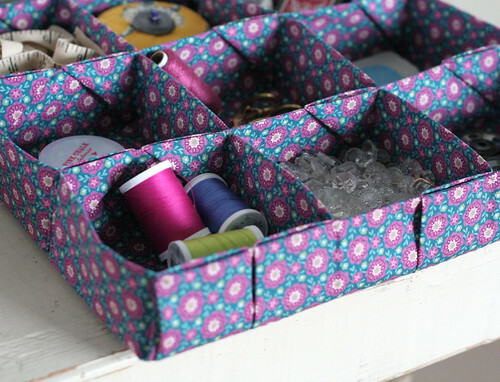 If Kathy made this again she would try CraftFuse or a heavier weight fusible to give the sides of the box more structure. The instructions and marking guidelines are 100% accurate. The folding and machine stitching can get confusing. Hang in there and follow the instructions. It turns out exactly as described in the pattern steps. Kathy replaced the fusible interfacing on the base with Pellon Peltex #72 (double sided fusible) extra firm stabilizer. She fused the bottom fabric to one side of the Pelxtex and then wrapped the fabric edges around and fused them in place. This gave the box a firm base to sit on. The double sided fusing kept the edges in place and made hand sewing the base to the top easy. 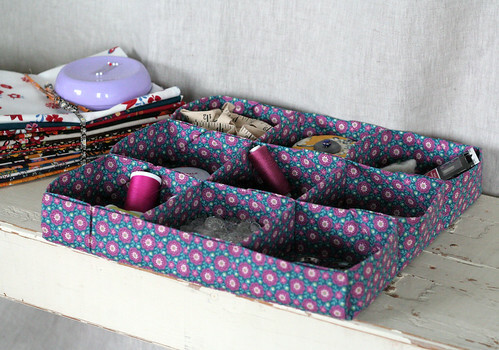 Kathy used Lecien’s Cosmo Embroidery Thread to secure the tops of the compartments. WOW! She’s a total convert (it’s strong and beautiful). Kathy ordered hers from her friends at Wooden Gate Quilts in Danville, CA. The pattern was clear and easy to follow. 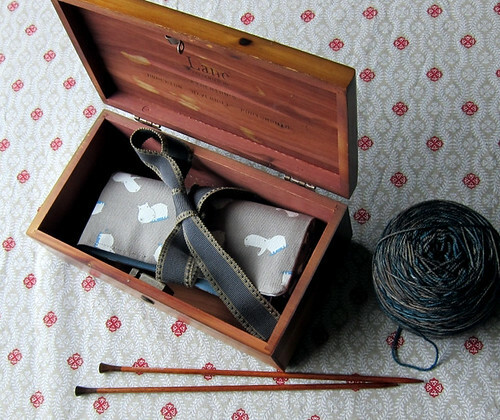 Alicia wanted to use the case for 6 inch long double point knitting needles rather than paint brushes. 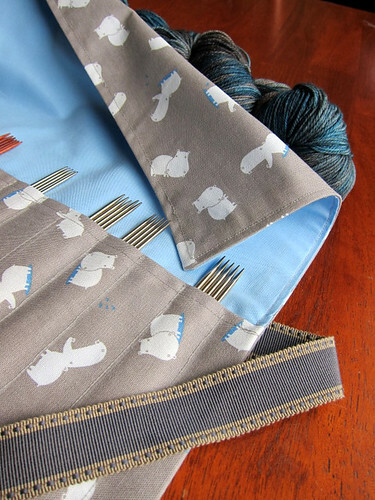 She made the following adjustments to fit the short needles: cut the front and back fabric 15″ tall (rather than 22″); cut the pocket 6.5″ tall (rather than 9.5″ tall). 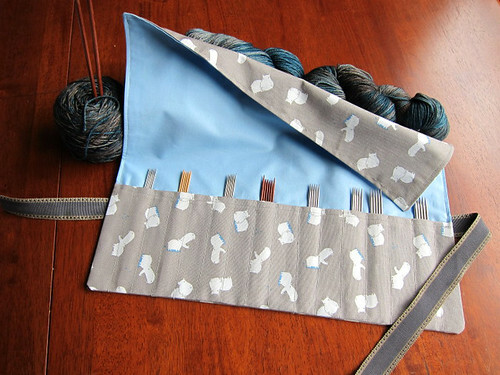 To accommodate the small needles (size US #3 and smaller), sew the needle pockets 1 inch wide. The pattern calls for medium or heavy weight fabric for the case. This is especially important for small, sharp double point needles – they’d puncture light quilting cotton. The hippo fabric is canvas-style and heavy enough to prevent poke-throughs. She also placed the ribbon lower than in the pattern. 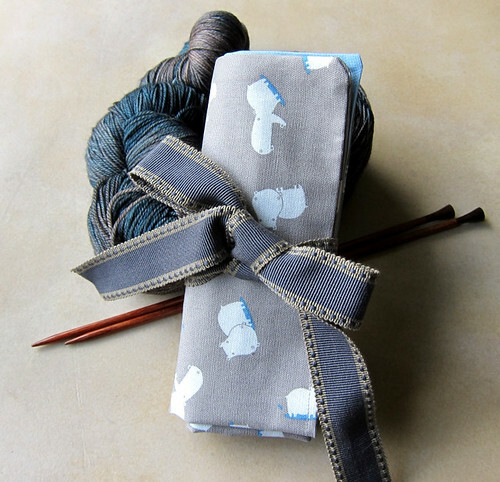 A perfect gift for knitters!